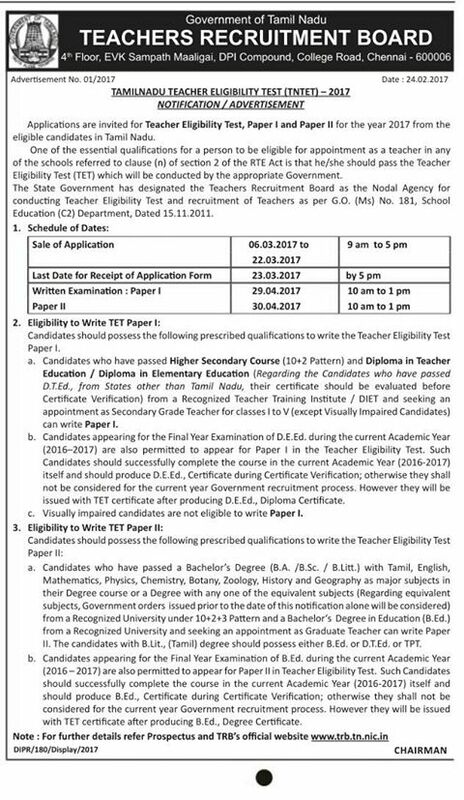 Teachers Recruitment Board, Tamil Nadu will conduct Tamil Nadu TET 2017 on April 29th & April 30, 2017. A large number of candidates who are looking for the teacher jobs applied for the recruitment. Candidates who had applied are searching for the TN TET Hall Ticket 2017 as it is the crucial document to carry for the exam and contains details regarding the exam venue, roll number etc. TRB released TN TET Hall Ticket. Candidates can download admit card. TRB has earlier issued Notification for the Tamil Nadu Teacher Eligibility Test-2017 will have Paper I and Paper-II. Candidates are required to visit the official website or the direct link provided below. After which the homepage will be displayed. 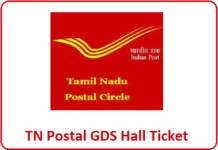 Aspirants will be required to click on Tamil Nadu TET Hall Ticket. Aspirants are required to enter all the required details in the provided fields. After which the aspirants will need to click on submit button. After which the admit card will appear on the screen. Aspirants are required to download/ take a printout for further reference. TNTET 2017:: The Tamil Nadu Teachers Recruitmet Board (TRB) has released the hall ticket of TamilNadu Teacher Eligibility Test 2017 (TNTET 2017) – Paper I and Paper-II in the official website. The candidates who have registered for the TNTET 2017 can download their hall tickets from the official website; trb.tn.nic.in. The TRB has informed all applicants that the decision of the Board to issue Hall Tickets to all applicants is purely provisional and does not confer any acceptance of their claim in the application. “Issuing the Hall Ticket and permitting the candidate to sit for the examination does not mean that their application form has been accepted by the Board. The Board reserves its right to reject the candidature at any stage of the recruitment”, TRB said. Regarding the candidates who have submitted their application without the photograph, the board has said that, those candidates have been provisionally admitted and uploaded their hall tickets without photograph. The board advised these candidates are advised to download the form the TNT website and fill in the details, affix a recent passport size photograph and get it attested by a Gazetted Officer. Tamil Nadu Teachers Recruitment Board has released an application forms for those applicants who want to get a seat in the coming TNTET 2017. According to the information in coming days the government of Tamil Nadu is going to manage Tamil Nadu Teacher Eligibility Test 2017. TRB prepares the merit list only. All matters concerning Appointments and Posting should be got clarified from the concerned User Departments.